It is Monday, and that means it is time to Skype-in to the Gliebers Executive Team meeting. Glenn Glieber (Owner): "... and she says to me, 'Don't you stand behind your product? ', and I said 'Of course I stand behind my product. But you bought the dress in 1997 and now you want to return it? Go return it at L.L. Bean, they'll give you your $79.99 back.' I know times are tough, but that kind of behavior ain't right. And then Harriet jumps on her blog and says we don't honor our returns policy, and I'm getting phone calls from the Milwaukee Journal-Sentinel about our lack of ethics. What is wrong with people?." Glenn Glieber: "Nice to have you here, Kevin. You mentioned that you're going to start leading us out of the wilderness. Let's give it a shot and see where it takes us. Kevin: "What I want to do today is tee-up the recommendations I'll make later this week by sharing with you important test results from your marketing department." Pepper Morgan (Creative): "What test, Sarah?" Sarah Wheldon (Marketing): "Boris Feldman ran a test, a year-long test, to measure profitability when catalogs are not mailed and when e-mails are not delivered to customers." Meredith Thompson: "What? We didn't mail catalogs to customers? Are you serious? Is that the reason our business is in the toilet --- because marketing is busy treating our business like a giant petri dish? My customers love seeing my assortment, we need to get it in front of her!" Roger Morgan (Operations): "Bow-Tie-Guy might have done something interesting. I recently read a Neptune Research report that says multivariate testing is critical to the success of an e-commerce brand." Kevin: "Take a look at the slide I forwarded you (click on the image at the top of this post). Boris Feldman created four test segments. One segment was treated normally. One segment was not allowed to receive catalogs. One segment was not allowed to receive e-mail campaigns. One segment did not receive any marketing all year long." Meredith Thompson: "Oh my God. No marketing, all year long?". Kevin: "Yes, that's correct. Now take a look at the last column. The last column reports the average annual profit generated by a customer. Which strategy was most profitable?" Pepper Morgan: "Zero catalogs and fifty-two e-mail campaigns. Holy cow!" Meredith Thompson: "This is insane. The most profitable strategy a catalog brand can employ is one where the catalog brand sends zero catalogs? Honestly, Kevin, you're nuts, no offense. Why would you even bother to share this with us?" Sarah Wheldon: "That's why I never shared the test results with all of you. I don't trust the results at all. We're a catalog brand, and the results suggest a catalog brand should stop mailing catalogs." Kevin: "We might be getting ahead of ourselves. In no way am I saying that you should stop mailing catalogs. I'm simply sharing the test results. I went back and ran my own scenarios. The two most profitable potential combinations were 6 catalogs and 52 e-mail campaigns, followed by 6 catalogs and 39 e-mail campaigns. 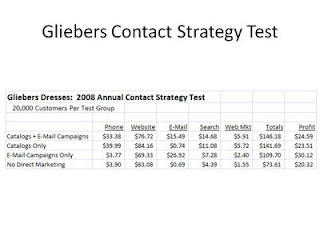 The data simply suggest that if the customer already volunteered an e-mail address to Gliebers Dresses, then Gliebers Dresses can reduce catalog marketing expense and generate more profit in the process, because the customer is telling you she wants to receive advertising in a digital form." Roger Morgan: "Isn't it an established best practice to be 'multichannel' with your marketing activities? In other words, we really should be mailing catalogs and sending e-mails to customers, because that's what multichannel customers like. And the more multichannel customers you have, the more successful your business is. It's that kind of circular logic that makes a multichannel business like ours thrive." Kevin: "The data suggest that multichannel customers might like to hear from Gliebers Dresses across multiple advertising channels. The data also suggest that there is an opportunity to 'optimize' the number of contacts, saving expense while generating additional profit." Pepper Morgan: "Kevin, can you talk a bit about the other columns in the table?" If catalogs aren't mailed, demand shifts into e-mail marketing. If e-mails aren't mailed, demand shifts into catalog marketing. In other words, e-mail marketing and catalog marketing are not complementary. They cannibalize each other. If catalogs are sent to the customer, the customer goes online, and uses paid search as a research tool. The more you spend on catalog marketing and e-mail marketing, the more the customer uses paid search, costing you more marketing expense. If you market more to the customer, then the customer uses affiliates and banner ads and portal advertising more often. Sarah Wheldon: "Isn't that nuts? The more we spend, the more the customer uses other tools, causing us have to spend more? I'll bet Google likes that! No wonder I keep reading articles suggesting we should increase marketing, not decrease it, during challenging economic times." Kevin: "Here is the single most important finding in the table. Everybody please write this fact down. If you do not market to these customers, customers will still spend 50% of the money they would spend if you marketed to them all year via catalogs and e-mail marketing messages." Kevin: "This is a good thing, folks! If you stop marketing altogether, your customers will continue spending half of what they used to spend. Your brand is strong enough that half of your sales will just happen, without any need for marketing whatsoever." Meredith Thompson: "I knew customers loved our merchandise!" Roger Morgan: "You mean customers hold on to the catalogs for years, or they bookmark our URL in Firefox?" Kevin: "Or they are simply loyal to your brand. Whatever the reason, the customer keeps spending some money. I call this the 'organic percentage'. Your organic percentage is 50%. This means that there are customers who are more profitable when they receive much less advertising. We can save money with these customers, and re-invest the money in different programs." Lois Gladstone (Finance): "Like a loyalty program. This would be a great way to fund a loyalty program! We send fewer catalogs to customers, and then re-invest that money in loyalty programs. And then we can keep spending money on customer acquisition, like Kevin recommends." Pepper Morgan: "Didn't Kevin show us that our business still falls off the cliff if we do a loyalty program?" Lois Gladstone: "That's if we cut back on customer acquisition. I'm not saying we cut back on customer acquisition. I'm saying we stop mailing so many catalogs to customers with an e-mail address, and then we re-invest the money in a really good loyalty program, and we keep spending money on customer acquisition like Kevin says. That's how we'll get out of this mess!" Glenn Glieber: "The program could have points, you know, you get 10 points for every $100 you spend. And then we'll have double point days, you buy a Quinceanera dress and you get 20 points for every $100 you spend. Buy a Wedding dress, and you get a 100 point bonus, because it is your big day." Lois Gladstone: "And once you hit 150 points, you get free expedited shipping for the rest of the year. I only fly on United Airlines because I get to sit in Economy Plus once I hit 25,000 annual miles. There's nothing Delta could do that would cause me to switch. That's the kind of thing I'm talkin' about." Glenn Glieber: "This thing could go viral, too. You earn 25 points for every customer you recruit to join the loyalty program. It's like really inexpensive new customer acquisition, and Kevin said we needed to keep the gas pedal pushed to the floor on new customer acquisition." Roger Morgan: "We'll give 25 point bonuses if the customer uses a new channel for the first time. You take that online-only customer, and you give them 25 bonus points if they purchase using the telephone. Then, the customer is multichannel, and is worth so much more. This thing really is multiplicative, isn't it? And the customer wins, because she earns points that launch her closer and closer to free expedited shipping?" Glenn Glieber: "Maybe we just do free expedited shipping, all day, everyday, every customer." Lois Gladstone: "We've run the numbers on that one. It doesn't work." Sarah Wheldon: "Are we saying that what is broken with this business is customer loyalty? I think that's what we're saying. And if that is what we're saying, then we're saying that the issue with loyalty isn't our merchandise, we're saying that the issue is marketing, that if we just had some catchy marketing strategy, we'd be fine. So our way of addressing the problem is to come up with a loyalty program that, in reality, isn't a loyalty program, but is a game that allows some customers to pay less to have merchandise shipped to them. Which means that we don't believe our problem is a merchandise issue, and that fundamentally, we don't believe our problem is a marketing problem, though Kevin says we can mail fewer catalogs to customers with an e-mail address. We believe our problem is our customer service, it is the cost we charge a customer to have a package delivered to her in a timely manner. What we're really saying is that the cost of great customer service is prohibitive to us, and that cost causes us to be uncompetitive, so customers are leaving us for other companies. Isn't that what we're really saying?" And for a brief moment, the room is quiet. Lois Gladstone: "I think we're saying we have to fix this business, now. Since it takes nine months to develop a new line of merchandise, we have to look at alternatives, you simply don't fix merchandise issues overnight. And because free shipping and handling all day everyday is fatal to our business model, we have to find another strategy." Meredith Thompson: "I don't believe the issue is with the merchandise." Glenn Glieber: "Ok, folks, we need to wrap this up. Kevin, can you bring your recommended strategy with you to Wednesday's meeting? Kevin: "Certainly. I will present my strategy for optimizing the current marketing plan and a plan for acquiring new customers." Glenn Glieber: "Good, we'll see you Wednesday. Now on to the next agenda item. It's come to my attention that some employees are eating Teriyaki at their desk for lunch, and that other employees find the odor offensive. So beginning today, no employees are allowed to eat offensive smelling foods at their desk. Roger, will you draft an e-mail communication from the entire Executive team, outlining this new policy." Meredith Thompson: "Define the foods that smell offensive?"